Well, here it is. At home, in my art space....my first inspired wall chart. 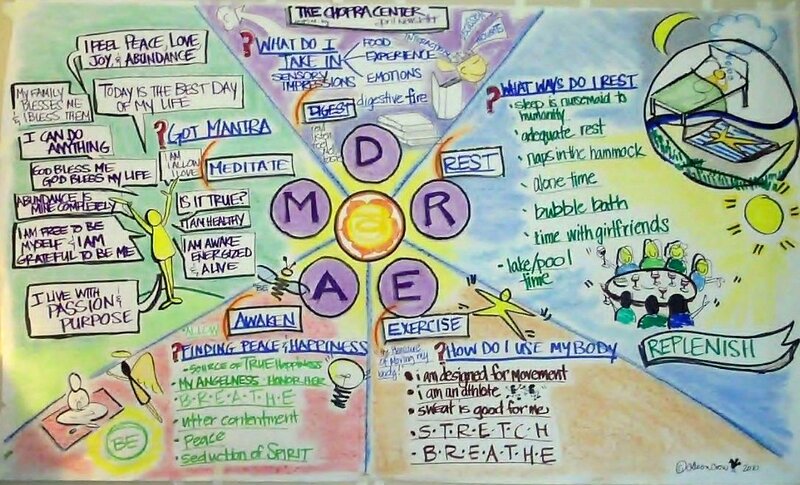 This is a personal chart inspired on Monday morning by reading this from The Chopra Center April Newsletter. Below are a few notes about the chart and then a few notes about what I learned about technique as I completed the work. Dare to dream has always been a personal mantra of mine so the core word DREAM really popped out when I read the newspaper. As I saw each of the subtitles. 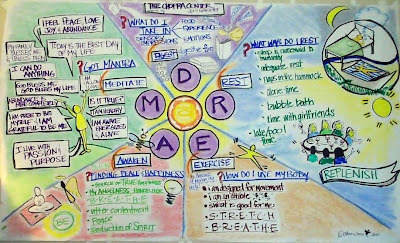 DIGEST, REST, EXERCISE, AWAKEN and MEDITATE...I KNEW I had to draw what flashed before my mind. I am generally open here and resonate with the image and the concept. The emotion associated with the 2nd chakra is passion & the element for the 2nd chakra is water. Yep...that pretty much sums me up. I found the E for exercise the most difficult section because for now it feels lost in my life. I have every intention to re-root myself here and thus chose the brown colors for grounding. S•T•R•E•T•C•H & B•R•E•A•T•H•E are my starting points in the journey. I will always remember my early work for the dimples caused by the uneven wall I am working on right now (gotta get to home depot and buy and 8x4 foam core board). I can also tell that some markers I like better than others (they tend to be the ones that bleed through and have 2 edges instead of 3). I will practice my lettering to become more consistent with the density of my lines and letters. For getting low, and staying in my body, I sat on a exercise ball. I did find that this let me get low, stay with my core and body to the area where I was working and it allowed for a natural movement better than me shuffling across the floor. My floor- HA!...the poor beige carpet. I've dropped a few markers, and the chalk dust is everywhere. Sorry honey, I guess I'll get a little mini vac for my 4th beroom-turned-art-coaching-studio. In all...I'm in heaven. When I started this Monday, I hooked up a USTREAM session (there are a few boring videos of the process..bad sound and apparently I couldn't be bothered to dress up or make up my face for the camera). Today even, on a group call I used the wall and did some graphic facilitation of our topic via the web with large chart paper on the wall. That is a whole new area...actually using this live with my clients...and the feedback from them was great. They loved the visual tools...and so did I.
I have loved seeing and reading your graphic coaching stuff... it is very inspiring!